What used to be confined to homes as a winter garment has become a political and cultural symbol, with most leaders and many citizens donning the long cloak at offices and their places of work, observes Athar Parvaiz. Their political ideologies might be poles apart, but Kashmir’s three famous and comparatively younger politicians -- former Jammu and Kashmir chief minister Omar Abdullah, and separatist leaders Mirwaiz Umar Farooq and Yasin Malik -- are hardly different when it comes to their obsession with Kashmir’s traditional winter garment, the pheran. Mirwaiz and Omar wear trendy pherans of different colours while Malik is mostly clad in black pherans in the winters, during press conferences or public gatherings. In Kashmir, it is common knowledge how the Abdullahs have utilised the services of the pheran to strike a chord with the people. Dr Farooq Abdullah has been doing it for a long time, but over the past few years, his son, Omar too has been doing it, and with style. Having been brought up in the United Kingdom, Omar struggles while speaking in Kashmiri. 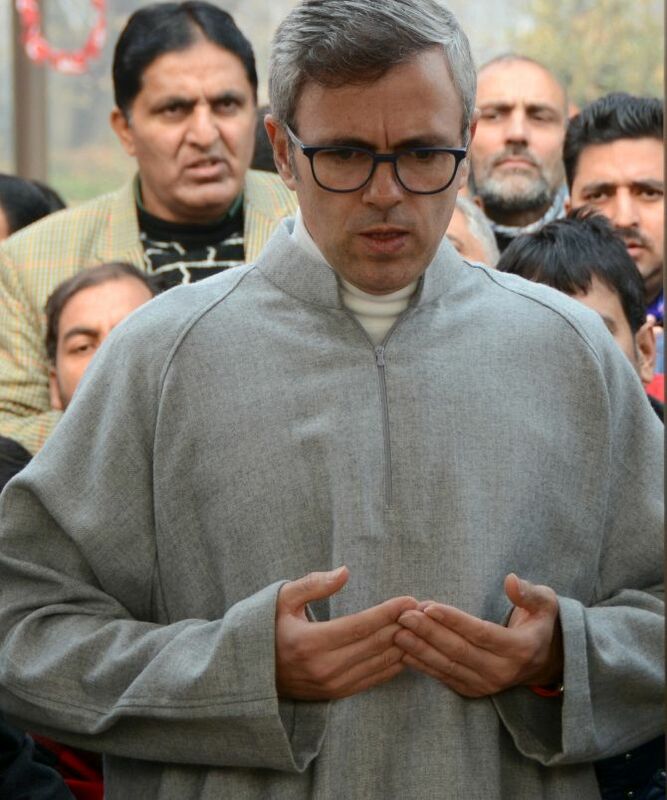 So, seemingly in an effort to get over his inability to speak in chaste Kashmiri, he often wears the pheran, sometimes way before winter. But, he has probably no idea that he, along with Mirwaiz and Malik, has put Kashmir’s grand old pheran back into vogue -- it had almost started fading away from the valley’s sartorial scene. 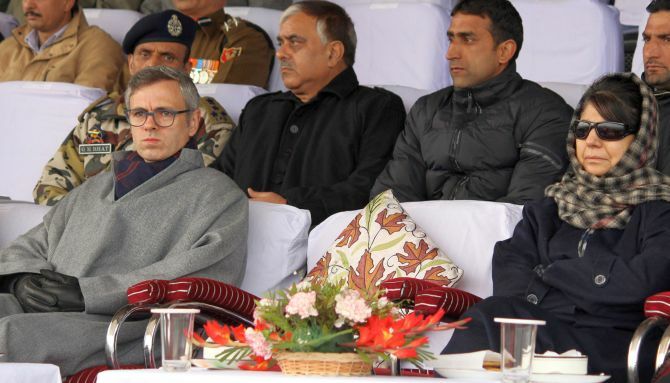 Three years back, when the invitation letter from Srinagar-based army’s 15 Corps contained a notification asking Kashmiri journalists not to wear the pheran while attending the army’s press conferences, Omar Abdullah took to Twitter to condemn the move. The army had to withdraw that notification, because of the umbrage taken by journalists and Abdullah, who was the then chief minister of Jammu-Kashmir. “People wear their pheran with pride. It’s part of our identity aside from the best way to stay warm in the cold. Can’t ban pherans,” Omar had tweeted. (external link). 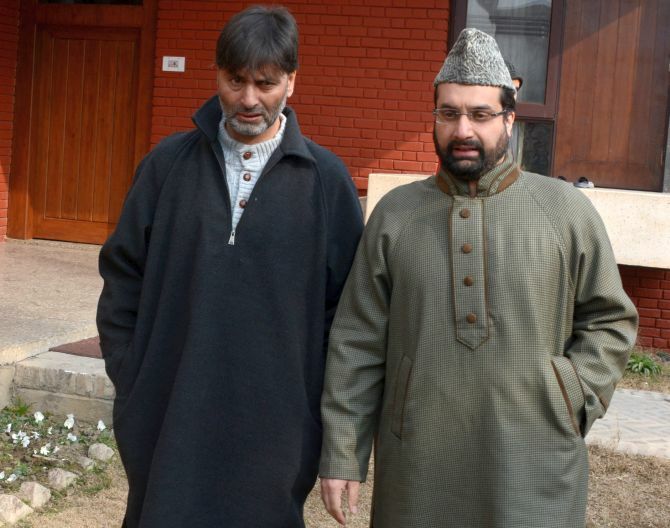 Mirwaiz and Malik may or may not be wearing the pheran for political reasons because both have been brought up in Kashmir and don’t participate in electoral politics, but they, because of their public profiles, also seem to have contributed in popularising the pheran as a preferable formal dress in winter by choosing to wear it outside their homes in winters. “When Omar decided to enter Kashmir politics, he was no different than a foreigner given his looks and the way he spoke Kashmiri. 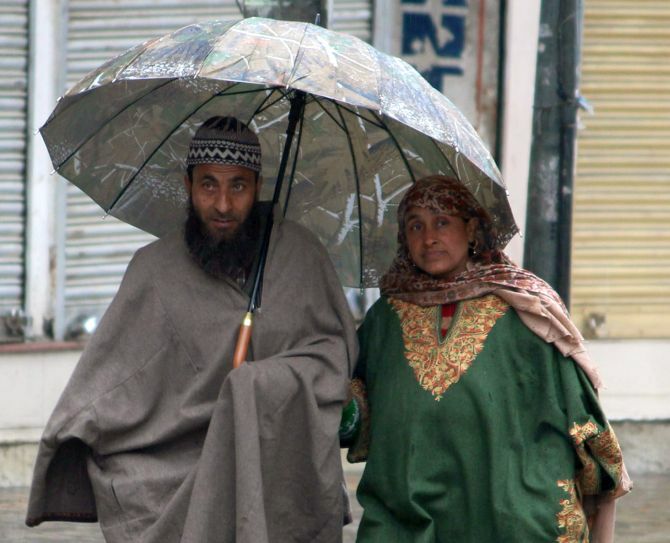 So, he found it easy to build his image as a Kashmiri through the pheran,” says Dr Farrukh Faheem of Kashmir University’s Institute of Kashmir Studies. On whether the political trio has contributed in popularising the pheran as a formal dress, he says that he is not sure about crediting it entirely to them, but the pheran has “largely been seen as the clothing of the common man". 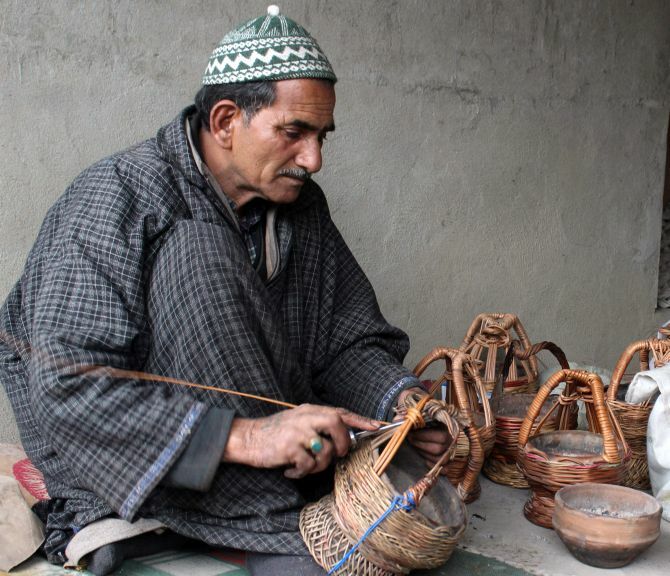 “When I say pheran was being seen as the common man’s clothing, I actually mean the pheran was more so associated with a commoner, economically and socially,” explains Faheem, who specialises in social theory and social stratification with considerable work experience in Kashmir. “Maybe, their choosing to wear the pheran often has helped making it fashionable as a sort of formal dress. Now the new designs of pheran make it appear better than an overcoat,” he says. According to Faheem, Malik’s special liking for black colour might have also contributed in dispelling the notion about black being an ominous colour and a colour associated with mourning. “Black was never seen as an acceptable colour in Kashmir except during Muharram by some Kashmiri Muslims. But, now, you see a lot of young people wear black pherans. It seems to be because of the particular security situation we have in Kashmir and Malik’s embrace of this colour,” he observes. Faheem also points out that since a large number of Kashmiri youth go out of the Valley for education and jobs, they realise the importance of Kashmir’s unique identity. “That is why we see a lot of people wearing the pheran with pride now. They have learned how to strike a balance between necessity, traditions and new trends. A network of boutiques, where young men and women prepare trendy pherans, and internet has made it much easier for them,” opines Faheem. At a famous garments store in Srinagar, a lady dressed gracefully enters the store enquiring if the pheran, ordered by her husband a few days back, was ready. She gets an answer in the affirmative as a salesman hurries down the stairs to get the pheran from the workstation. The owner of the store, Mohammad Ashraf, tells me that the pheran she is about to collect is the third one her husband, a doctor, has ordered this year. “He used to take long coats from us for winter. But he said he has stopped wearing coats as pheran is much easier to handle,” Ashraf says, and adds that the designer pherans which are now available at most of the tailoring shops in Kashmir, are so well-designed that people, especially youth, find them quite attractive. Until a few years back, if someone would come to office wearing a pheran, he would be frowned upon. Pheran was largely confined to Kashmiri homes as an important winter garment which people would wear while staying home or within their respective localities especially in urban areas. It was considered a highly informal dress which, Kashmiris thought, makes a person lethargic given its weight and large size. Not anymore. Now, with various modern designs of pheran available in the market, youth take pride in flaunting their trendy attire. In the past four-five years, wearing a pheran even while attending office, is gaining a lot of traction among valley-ites, especially youth. Young Kashmiris, who mostly speak in languages other than Kashmiri (because Kashmiris in the past two-three decades have discouraged their children to speak the mother tongue), now discuss pheran designs while sipping coffee in Srinagar’s coffee shops which have proliferated across the city in recent years. It is simply because the pheran has now become an over-garment which not only keeps people warm, but also offers a great deal of sartorial elegance thanks to the designs available in the market. In the past two-three years, many Bollywood actors like Shahid Kapoor, Ranbir Kapoor and Salman Khan, during their film shoots in Kashmir, also wore the trendy pherans on and off the film shoots. So, after getting influenced by modernity for years, Kashmiris finally realised that they need to revisit their cultural roots. “It was basically the outcome of economic and social mobility, which started in Kashmir since the late 1980s. With good purchasing power and exposure to cultures outside Kashmir, people started adapting to not only western-style clothing, but also abandoned the traditional ways of constructing houses which would save them from harsh cold of winters,” says Dr Peerzada Amin, who heads the Sociology department at Kashmir University.